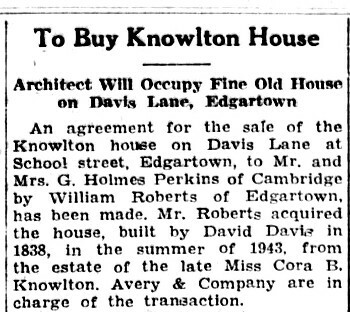 An agreement for the sale of the Knowlton house on Davis Lane at School street, Edgartown, to Mr. and Mrs. G. Holmes Perkins of Cambridge by William Roberts of Edgartown, has been made. Mr. Roberts acquired the house, built by David Davis in 1838, in the summer of 1943, from the estate of the late Miss Cora B. Knowlton. Avery & Company are in charge of the transaction. Mr. and Mrs. Perkins, who are newcomers to the Island summer colony, although Mrs. Perkins stayed in Edgartown once, as a child, in the Yandell studio, plan to occupy their new property this season. Mr. Perkins, an architect, is a professor at Harvard, connected with the Department of Regional Planning in the Graduate School of Design. The house, with its touch of elegance and distinctive woodwork, was built by Mr. Davis, state legislator and governor’s councillor, for use as an academy. Mr. Davis had built a schoolhouse on the site in 1836, but it burned down, and the present building was erected by the collective effort of the original owner and friends who came to his aid. The twin side doors are said to have been separate entrances for boy and girl pupils, and the large room on the School street side the classroom. The schoolroom, in those bygone days was also used, on occasion, as a hall and meeting place. In the yard are a beautiful elm and two huge box bushes.